কেমন হল আপনার আমেরিকা সফর? কিছু না বলে সিলড চিঠি তিনটি তার হাতে দিয়ে অনুরোধ জানালাম খুলে পড়তে। তিনি তার রিডিং গ্লাস আনিয়ে চিঠিগুলো মনোযোগ দিয়ে পড়লেন। পড়া শেষে প্রথমতো তিনি কিছুটা স্তম্ভিত হয়ে গেলেন! পরে উচ্ছ্বসিত হয়ে জিজ্ঞেস করলেন এটা কি করে সম্ভব হল? তা অবশ্য ঠিকই বলেছেন। এবার বলুন, আমার করণীয় কি? সরকার গঠনের পরমুহূর্ত থেকেই প্রেসিডেন্সিয়াল সরকার পদ্ধতি পরিবর্তন করে ওয়েস্টমিনস্টার এর আদলে সংসদীয় গণতন্ত্র কায়েমের দাবি তুলেছে আওয়ামীলীগ ও এরশাদের জাতীয় পার্টি। অন্যদিকে জামায়াতের তরফ থেকে আগামীতে ‘কেয়ার টেকার সরকারে’ এর অধীন নির্বাচনের একটা দাবি তোলা হবে। এই দুইটি ইস্যুতে তারা যুগপৎ আন্দোলনে যাবে সংসদ এবং সংসদের বাইরে শুনতে পাচ্ছি। এই দুইটি ইস্যু সম্পর্কে আপনার মতামত কি? এই বিষয়ে বিশদভাবে বিচার-বিশ্লেষণ করবেন এবং সিদ্ধান্তও নেবেন আপনারা। তবে আমার ব্যক্তিগত মত হচ্ছে দুটোই সুদূর প্রসারী রাজনৈতিক কূটচাল যাতে বাংলাদেশে কখনোই কোনও স্থিতিশীল সরকার কায়েম না থাকতে পারে। এর বিস্তারিত যুক্তিভিত্তিক তর্ক অবশ্যই হতে পারে। আমি সে ধরনের কোনও বিশদ আলোচনায় না গিয়ে শুধু বলবো ‘প্রেসিডেন্সিয়াল ফর্ম অফ গভর্নমেন্ট’ দেশে প্রথম জারি করেছিলেন কালুর ঘাট থেকে মেজর জিয়া পরে শেখ মুজিবর রহমানের মতো একজন ব্যক্তি যার কথাই ছিল আইন। তারপরও তিনি এই পদ্ধতির সরকার প্রবর্তন করতে বাধ্য হয়েছিলেন কেনও? আর রাষ্ট্রীয়ক্ষমতা হাতে নিয়ে প্রয়াত শহীদ প্রেসিডেন্ট জেনারেল জিয়া এবং পতিত প্রেসিডেন্ট জেনারেল এরশাদ সেই পদ্ধতিটি বলবৎরেখেছিলেন কেনও? In the evening he will come with Jim. After talking with me in details it would be decided by him which course we shall charter. Due to long flight you are also tired so take a good rest and get freshened up. Ganga Bhai left. The city of Washington is divided into two halves by the Potomack river. At one bank is the Verginia and on the other bank is Merryland. Ganga Bhai lives in Verginia. his palacial residence is in a quite lush green surrounding. Whenever we visited Washington we had to stay at his residence. Before dusk Ganga Bhai arrived with Jim to my suite. Jim welcomed me with a warm hugg. He had represented his constuency at a streach for over three decades as a congressman. Jim, a man with razorsharp intelligence, far sighted, full of wisdom and experienced veteran politician is an influencial and powerfull person in the corridor of power in United States. The government comes and goes but it does not affect him because, he has a long standing relation with the policy makers. I have seen regardless of party affiliation, how he is adored and respected by most of the congressmen and senators. After ordering for a high tea we the three friends sat together. At the very start I personally thanked Jim and all other friends who had come forward to help the humaneterian cause of the devastating cyclone victims for evaquation and rehabilitation. The Prime Minister had also expressed her gratitude for their efforts in this regard. Saying so I handed over the sealed envelops containing letter of thanks signed by her and drafted by me along with the note verbal assigning me as her special envoy. Now, tell me what is the result of the ‘Operation Sea Angles’, what is the reaction of the people of Bangladesh? Asked Jim. I informed Jim the timely action of ‘Operation sea Angles’ had saved life of millions in the affected area. The Marines of the 7th Fleet shoulder to shoulder alongwith the members of Bangladesh armed forces have done miracle! The whole nation is watching astonishingly how the brave ones are carrying out an impossible mission to save millions of helpless and dspaired water logged people. I have seen on the spot how the distressed people are parying for their saviors. To each one of them every US Marine and member of Bangladsh armed forces are considered as God sent real angles! All about this operation is well propagated in national and international print and electronic Media. The daring ‘Operation Sea Angle’ will ever remained ingrained in the memory of Bangladeshis for ever. I personally feel, the kind of positive impression this timely humanitarian decision has been imprinted in the mind of people not only remove the misgiving about the role of USA during the liberation war to great extent but will also have a far reaching positive mark in the by lateral relation between United State and Bangladesh. But to lay the foundation for the sustainable bilateral relation one thing in particular the policy makers in US must bear in mind. To the progress and prosperity of Bangladesh the main impediment is expansionist India. That is why every Bangladeshi at present has become extremely anti Indian. In view of this reality, for the interest of USA it would be prudent to look at Bangladesh separately not through Indian glasses. Otherwise, the bilateral relation between America and Bangladesh will not be ever smooth and durable. Jim was listning me quitely with keen interest. Whatever might be the amount that realy does not matter, I on behalf of all the friends is accepting this contribution with due respect appreciating her sincere guesture. I shall certainly reach your words to her on return. Now, I shall take the liberty to discuss the 2nd most important issue with you. Please feel free, what do you want to discuss. In ’71 a well deliberated ‘Peace and Friendship Treaty’ was signed between Soviet Union and India before the war had started. After the defeat of Pakistan in the short war of ’71, a 25 years uneven ‘Peace and Friendship Treaty’ was also signed between Indira Gandhi and Sheikh Mujibur Rahman’s government. The intention of this treaty is to turn Bangladesh into a vassal state of India gradually. This blue print was chalked out during the liberation war and despotic Sheikh Mujib had signed that treaty of enslavement against the will and wishes of the people just to perpetuate his power. But unexpectedly on 15th of August 1975 the despotic dictatorial regime of Mujib was overthrown by a popular uprising speared by the patriotic armed forces that vicious design of India backed by USSR went into fixes. To defeat the popular uprising of 15th August Indo-Bakshalite nexus attempted to stage a putch under the leadership of one Brig. Khaled Musharrof and his cronies but that attempted putch was foiled through another popular Sipahi Janatar Biplob(Soldiers and people’s revolution) spearheaded by the same patriotic members of the armed forces who had led the 15th August uprising. Even after this conspiracy to take back Bangladesh to pre 15th August days had been going on. Bangladesh had to traverse through a few ominous ups and downs till this date. During these ups and downs the elections were held in 1991. The Awami League, fully supported by Indo-Soviate axis was more than sure to win. 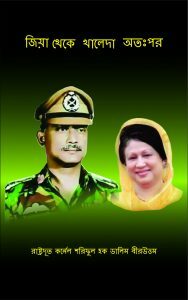 They thought due to heavy handed repression and oppression of dicator Gen. Ershad another stooge of India who ruled the country for long 8 years after usurping state power after the demise of Gen. Zia with the support of Awami League of Sheikh Hasina it would be easy to defeat much weakened BNP the party of Khaleda Zia. But the people of Bangladesh had proved their speculation and amazingly voted Khaleda Zia’s combine to power. This unexpected victory through democratic process could not be accepted by the defeated Awami League supported by Indo-Soviet axis. Therefore, just after the result of the elections were announced sheikh Hasina warned in a press comference that Khaleda’s government will not be allowed for a moment to be at peace. Not only that as the leader of the opposition the lady and her party are hatching multy prong conspiracies continuously to destabilize the government of Khaleda Zia along with Gen. Ershad. Even Jamaat e Islami is being elured to join in those conspiracies. In view of this Khaleda Zia is wanting to come on a state visit to USA at the earliest to streanthen the bilateral relations to counter the looming threat to her elected government. Not only that she also desires other than USA to establish personal relation with the invisible powerful and influential policy makers in the corridors of power of the major capitals in Europe and Noth America for mutual interests of Bangladesh and those countries. She has taken this decision advised by you though you have not mentioned, I can fully understand that my dear friend. Taking your advice the Prime Minister is trying to proceed in the right direction that is praise worthy. As your friends we shall sincerely try our best so that her desire becomes fruitful. Tomorrow morning Ganga will bring you to the Capitol Hill. There we shall be holding meetings with you. Out of the common friends, Bob, Jessy, Hamilton, Harry and me would be present. There we shall deliberate on your detailed presentation. There after we shall convey to you our decision. More over within 2 to 3 days we shall also explain the modalities on our behalf how to execute the decision. I shall be apprising them about your mission in short beforehand to facilitate a free and frank discussion. Some of the friends were Jews. But after knowing their character traits and human qualities no one can evade from admiring and respecting them. This only testify that good and bad coexsists in every religion. Religious fanaticism and hate rate could never turnish our friendship. Other than my agenda discussion also focused on USA’s Global out look including Bangladesh. The friends had held the discussions with me with lot of interest. They were happy to note Khaleda Zia’s gratitude. They also appreciated that the Prime Minister Khaleda Zia had thought rightly and decided to take correct initiative as advised by me to streanthen the bilateral ties with United States and other Western powers. They told me that the endeavor to develop her personal relations at the corridors of power would be done through Jim. So, now my responsibility would be to introduce Jim to the Prime Minister Khaleda Zia at her earliest convenience. There after Jim would maintain contact on their behalf with the Prime Minister as and when required. He would be the link man working between both the sides. Before we closed our discussion Jessy said that Jim would be handing over their written decision on my agenda. After the meeting Jessy invited me and Ganga Bhai on behalf of all the friends over lunch in an exclusive club. There I was introduced to a few new friends by Jim. After the lunch Ganga Bhai drove me back to the hotel. There we, the two friends sat down to summarise the whole day’s exercise. I believe your forcefull substantial and candit presentation to the friends and questions and answers were very satisfying. So, it can be taken that their decision would be positive and your visit is going to be successful. There is a subtle indication was there in what Jessi had said. He said that their decision would be conveyed through Jim in black and white. When I hear from Jim when the decision would be conveyed I shall come to you with him. Ganga Bhai took leave and went away. Without any prior information you have appeared like a comet! Is Nimmi accompaning you? No, as I have come on a special mission this time so, I did not bring her along. In that case if you are free than I would like to bring you to my residence. Where are you putting up? At the Hilton. You don’t have to come as it has already started drizzling. Rather, you give me the address and I shall come with a hotel Limousine. Mama was residing at Marry Land. He gave the address and I reached his residence. It did not take much time to reach his residence crossing the Potomack. As I pressed the bell Mama himself with a smile welcomed me at the door and took me in. Mami followed. As he asked her to prepare dinner she went to the kitchen after exchanging greetings. Their only daughter was still a baby so she was asleep. Whats up Mamu, why on such a quite visit? With what agenda Khaleda has sent you this time? কি মামু এমন চুপিসারে ওয়াশিংটন সফারে কেন? খালেদা কি এজেন্ডা দিয়ে পাঠালেন এবার? To implement her agenda you all are here. Mama used to like me a lot. He was not only a ‘Kali Narayan’ scholar but an ocean of knowledge. He was adorded by all as an unstained and powerful bureaucrat. Mama is an unique example of honesty and outspokenness. We all were together during the liberation war. Everybody regardless of any party affiliation or belief used to respect him. I had to come secretly as her special envoy to convey her personal gratitude to all my friends who had convinced the US President to divert the 7th Fleet and to launch ‘Operation Sea Angles’. She had also requested to arrange for a state visit to United States at the soonest possible time. Mama, this visit of mine is strictly condidential. Not to worry mama, be rest assured, I shall only remain as a living witness to your this historical secret visit. I thanked him and returned back to the hotel in mids of heavy pouring. It was a night to remember. On the 4th day with prior intimation Ganga Bhai arrived at the hotel alongwith Jim in the after noon. Hearty congratulation my dear friend, your mission has achieved great success. I was slightly flabbergasted at their exuberance! All three of us sat on the sofas. Ambassador Haq, your presentation and questions and answers were reasonably so much forcefull that after serious deliberation and considering various aspects all had opined that both of your proposals should be considered acceptable on marit and all the necessaty steps would be taken with utmost seriousness to materialize the consentious decision at the earliest. But more than that a great surprise has been mentioned in these letters. Neither you or your Prime Minister could ever imagine that. I was handed over three sealed envelops along with an open one. Copies of those three letters were there in that open envelop. All these three sealed letters were addressed to the Hon. Prime Minister and marked as CONFIDENTIAL. The letters were written by Senator Jessy Helms, Chairman of the Foreign Relation Committee of the Senate. Congressman Bob Toresoly, Leader of the House and Senator Hamilton, Chairman of the Endownment Committee of the Senate. I took out the copies and went through them. The gist of all three letters were more or less the same. All the necessary measures would be taken to arrange Khaleda Zia’s visit to United States at the earliest possible time. All kind of help and assistance would be provided to her for developing personal relationship as desired. Not only that being the first elected lady Prime Minister of Bangladesh she would be honored with the rare opportunity to address the Joint Session of the Senate and the Congress during her state visit. Hearty congratulation my dear friend, your mission has achieved great success. I am feeling embarrassed to read the comments of my good friends about me. I would been far more comfortable if those were not written. No one has dictated those to the persons who had written those letters therefore, I find no reason for you to be embarrassed at all my dear friend. Jim replied. Meanwhile high tea has been served so, I requested Jim to convey my heartfelt thanks to the friends for the letters and changed the topic. Come on now, lets have a bite. when are you planing to go back? May be to night or tomorrow via London to Tanzania and from there to Nairobi and then to Dhaka. You can call me any time you feel it is necessary. There after we spend some time togather talking about lighter aspects of life and Jim said good bye. ganga Bhai from the hotel boocked me on a flight to London the same night and after a day layover to Tanzania. In time he saw me off at the airport. In London I did not contacted any one this time and reached Darussalam after spending a day and night at London. As I returned home everyone knew that I have come back from Tanzania tour.